Cannot be Normal Summoned/Set. Must first be Special Summoned (from your hand) while you control a “Photon” or “Galaxy” monster. Cannot attack the turn it is Special Summoned. You can only Special Summon “Photon Vanisher(s)” once per turn. If this card is Special Summoned: You can add 1 “Galaxy-Eyes Photon Dragon” from your Deck to your hand. An Xyz Monster that was Summoned using this card on the field as material gains this effect. 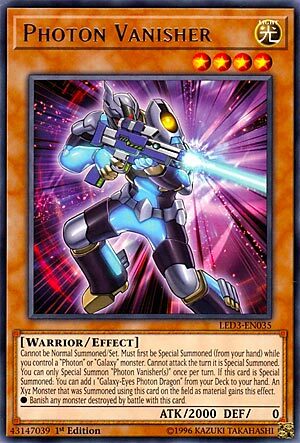 Photon Vanisher is another monster to use in a Cyber Dragon deck, or any deck that is LIGHT-based. The requirements to Special Summon are nothing when you run Galaxy Soldier, so that will be easily attained, even if you need a Photon token to do so. Search ability for a Galaxy-Eyes Photon Dragon can be good if you run Galaxy-Eyes, but if you don’t then you are using this monster purely for field presence. Link Summoning with this and other Galxy monsters is easy, but the Xyz effect Vanisher gives the monster it is used for is great. Robbing your opponent of monsters in their graveyard is strategy-breaking for decks that rely on monsters going to the grave or being in the grave for other cards. For the Galaxy and Photon decks, this card is a must, but for other decks this card can be thrown into, it is an instant Rank 4 that can banish off of battle destruction. A Utopia the Lightning that can banish is a fearsome thing to stare down, let alone a Number 86: Heroic Champion – Rhongomyniad. Photon/Galaxy is one of my preferred archetypes. That being said, Photon Vanisher is what would now be considered standard support. It’s a Level 4 Light Warrior-type monster with 2000 Atk and 0 Def. Unfortunately, this card cannot be Normal Summoned or Set, which makes sense considering the awesome stats. It also cannot attack the turn it is Special Summoned and it can only be Special Summoned once per turn. At least it can be Special Summoned multiple ways, but only after it was properly Special Summoned from the hand first. That task is easy, you just need to control any Photon or Galaxy Monster already. For all those restrictions there better be an awesome effect. Photon Vanisher searches a Galaxy-Eyes Photon Dragon from your deck to your hand upon Special Summon. It should have just been any Galaxy or Photon card for all those restrictions, but a search is nice. If it’s used as XYZ material from the field, the newly XYZ Summoned monster can banish anything it would destroy. Again, this effect just misses the mark. If it was any XYZ monster that had Photon Vanisher as material gained that effect, then the larger XYZ monsters would be able to enjoy a bonus banishing effect. Instead, only Rank 4 monsters can realistically gain the banishing effect, and only Galaxy-Eyes Photon Dragon decks can utilize the search effect. It does help with Link Climbing, but only if you’re using other generic Galaxy or Photon cards, ie Thrasher or Soldier. You can’t even really make a good Soul Charge play with this because it can only be Special Summoned once per turn. 2 should be fine, but Photon Vanisher is just not versatile enough. Next up for Legendary Duelists month I’ll look at a piece of Photon support in Photon Vanisher. Photon Vanisher is a Level 4 LIGHT Warrior with 2000 ATK and 0 DEF. ATK is great, DEF of 0 is always bad (I promise the theme of this week isn’t 0 DEF), being LIGHT and Warrior is great especially on a Level 4. Vanisher sadly cannot be Normal Summoned or Set and must first be Special Summoned from the hand while you control a Photon or Galaxy monster, Photon Sanctuary gets you two Photon tokens to summon the new Link Monster in Soul Fusion, Thrasher can be Special Summoned from the hand, you can use Accellight to get a Photon or Galaxy from the deck, Galaxy Soldier can summon itself at the discard of a LIGHT monster and get you a search, or you can Normal Summon something like Galaxy Wizard. It is very clear that getting Photon/Galaxy monsters out is very easy. This card cannot attack the turn it is Special Summoned and you can only summon Vanisher once per turn this way, which isn’t that bad really since you’ll likely use Vanisher for a summon of something and you should only really need one in a turn. If Vanisher is Special Summoned, you can add a Galaxy-Eyes Photon Dragon from the deck to the hand. Photon/Galaxy strategies really love Galaxy-Eyes Photon Dragon, it is a very important piece of the deck , so it is fitting the card now has its own specific searcher, and a good one at that. If Vanisher is used as XYZ Material for a summon, the XYZ Monster used it as material gains the effect that any monster it destroys in battle is banished instead. Fitting that in this set, Photon/Galaxy got a new Rank 4 XYZ as well, banishing is always great to have, no matter what form it might be in. Vanisher is a great piece for Photon/Galaxy decks and I feel 2 or 3 is great, despite the cards in that deck now being highly searchable. Art: 4/5 Shhhhh, I think he sees a Number Monster. Photon Vanisher is a fun little Warrior. Level 4, Light, 2000 attack (0 defense, but cards do need to have a downside after all)…almost everything is going his way at a glance. Though I could see an argument for a Machine here, he does look sort of armored, and that blaster is clearly Machine tech. Can’t be Normal Summoned or Set, but easily Special Summoned from the Hand when you control a Photon/Galaxy Monster. Cannot attack the turn it’s Normal Summoned, so that gives you a 2000 attack wall, or something you want to use for an effect, or to XYZ, Link, Synchro, whatever you’re doing, probably XYZ in the Photon or Galaxy Deck. Continuing, you can only Special Summon this guy once per turn, which is appropriate, to prevent mass swarming and combos. Furthermore, if this card is Special Summoned, you gain a Galaxy-Eyes Photon Dragon from your Deck to your Hand (and this is where we’re seeing the combo potential, at least to start) and lastly, an XYZ Monster that uses this card for an XYZ Summon removes from play any Monster it destroys in Battle. Like the Galaxy Dragons need to be more powerful. Removal is good, how easy Vanisher makes GEPD come out is almost disgusting, but amazing.